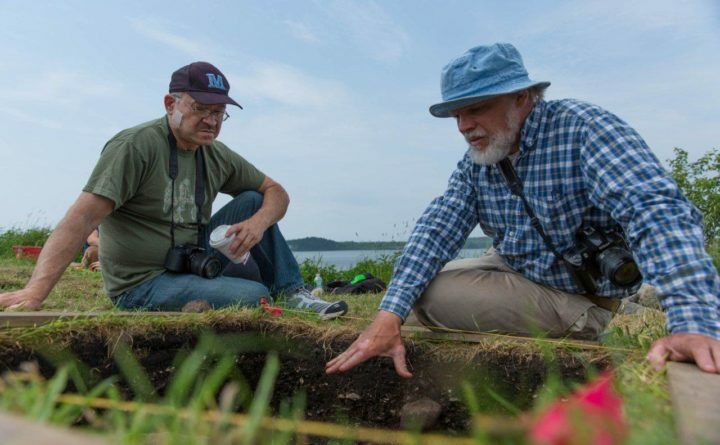 Donald Soctomah (left), historic preservation officer for the Passamaquoddy Tribe, and Brian Robinson, a University of Maine professor who died in 2016, are pictured here in 2013 examining a dig site at Long Point in Machiasport. In 1980, Passamaquoddy tribal historic preservation officer Donald Soctomah heard some very old audio recordings of Passamaquoddy songs and stories for the first time. They were filled with static and it was hard to make out the words, but the wax cylinders — the first widely available technology used to record sound — were recorded in Calais in 1890, making them the oldest known recordings of any Native American words or music and the first-ever anthropological field recordings. Amid the static, Soctomah could hear songs and stories that Passamaquoddy people likely sang for centuries, some of which had been lost for decades. 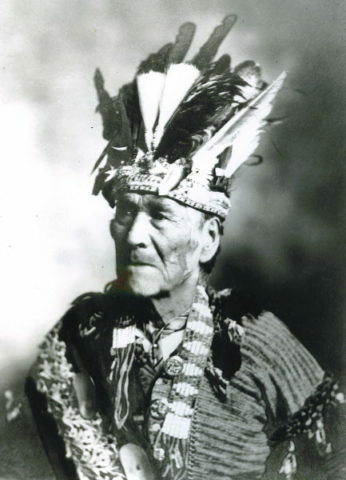 Sopiel Selmore, chief of the Passamaquoddy Tribe, was 80 in 1895. The great-great-grandfather of Donald Soctomah, the current tribal historian, Selmore also served as the tribe's historian of his time. Selmore was alive when the recordings by Jesse Walter Fewkes were made. The historic recordings not only hold great significance for the Passamaquoddy people, but they are also landmark items in the field of anthropology and in the history of recorded sound. In the late 1970s, the American Folklife Center’s Federal Cylinder Project aimed to preserve the Passamaquoddy recordings and other early recordings, and in 2002, the cylinders were added to the National Recording Registry, in honor of their cultural significance. According to Soctomah, the phonograph used to record the Native singers onto the cylinders back in 1890 was actually on loan to anthropologist Jesse Walters Fewkes from Thomas Edison himself. Fewkes was the first anthropologist to record indigenous people using the new technology, leading the way for wider study of folk and traditional music, or ethnomusicology. He later traveled to the American Southwest and throughout the Caribbean documenting the culture of indigenous people. 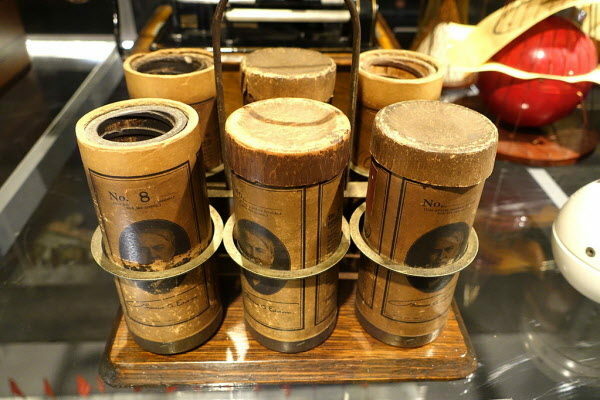 A wax cylinder from 1895, not unlike the one onto which the Passamaquoddy songs were recorded in 1890. New technology has made the 129-year-old recordings even easier to listen to and comprehend. For the past few years, staffers at the Library of Congress have been painstakingly digitally restoring the recordings to remove most of the static Soctomah heard back in 1985. Soctomah and a team of fluent Passamaquoddy speakers have then been transcribing the songs and stories — bringing back a part of the tribe’s oral history that hasn’t, in some cases, been heard for more than a century. Because of their sacred nature, most of the recordings will not be made available online, but a handful are available to listen to on the Passamaquoddy People website. Soctomah and Passamaquoddy language teacher Dwayne Tomah will give a presentation on the recordings at 4:30 p.m. on Monday, Feb. 18, at the Abbe Museum in Bar Harbor. Soctomah will play some of the restored recordings and talk about the process of restoring them, and Tomah will sing some of the songs transcribed from the recordings. Soctomah and Tomah presented a similar program last summer at the Library of Congress. Soctomah has dedicated his life to the preservation of his tribe’s language, culture and history, from helping to return land on Machias Bay that contains ancient petroglyphs to the tribe, to serving several terms as a tribal representative to the Maine Legislature. He helped to create Native American Veterans Day in Maine, and served as administrator of a language-learning immersion course for Passamaquoddy preschoolers, launched in 2015. The cylinder project is just his latest endeavor. Soctomah said that so far, only three of the 31 known wax cylinders have been restored and transcribed, and that the process is slow and laborious — though the results help preserve priceless cultural heritage. For more information on the project, visit the American Folklife Center website.